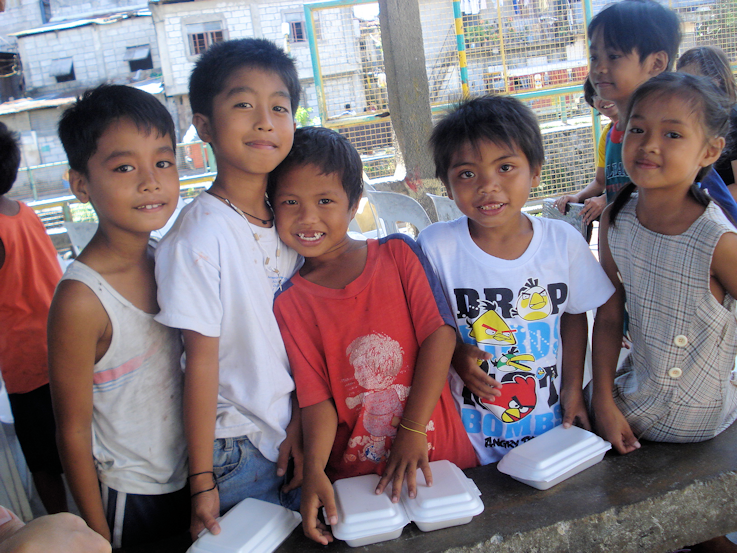 A hot meal is so significant for the children who receive a daily meal prepared at the Gerard- Chapman kitchen in Manila and distributed by volunteers from Cathedral of Praise. Director, Beverley Sumrall, writes: "I try to describe in words how the feeding is, but I just thought I would send a little photo one of the girls took recently. It might help describe how these children live their lives and what a daily hot meal every morning means to them. What a difference you are making Sunday Line!" "I want to express my thanks to you and to the partners of Sunday Line for the continued love and support of our street children in Manila. Bernice and Velma visited us a number of times and loved these children. They participated in the feeding themselves, and had such a heart to support and feed these precious little ones. Honestly when Velma went to heaven, I thought that would be the end of an era. But then I found out that the partners of Sunday Line had hearts that just don't stop loving, just don't stop giving to the Lord and to these children. Over the years we have certainly grown in our methods and effectiveness in feeding the kids. From almost random selection on the streets at night, we went to being in one location for a week. That worked so well we ended up going to one location for a quarter at a time. This allowed us to solidify the people in the area in their walk with the Lord and let them see a different path to walk in life. So many people who are living in poverty at that level are also very fatalistic, thinking, "My mother was born here, I was born here, my child was born here, that's just the way life will always be." To get people looking upward to the Lord and understanding that He will be there for them, that takes time. 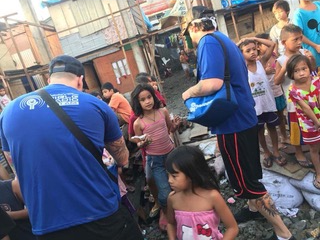 Now, since the later part of 2015, we have been focused in one massive area of Manila called "Happy Land." Believe me when I say there is nothing happy about Happy Land. It is a slang word taken from a Filipino word naming the area. Sewerage flows freely all over the ground we walk on. Those living in make-shift shanties are considered the blessed ones. Children live on the streets. When asked when their birthday is they have no idea; no idea how old they are. They simply exist. And existence in Happy Land is a rough and tumble, day-to-day struggle. Disease and malnutrition runs rampant. Children who are blessed to go to school do not prosper there because they cannot focus on their lessons. Eventually most drop out after one to three grades. Then, a few years ago when a super storm hit the center of the country, we made the most amazing discovery. One of the relief organizations we worked with was giving what they call "manna packs" - a box of rice/soy based meals that simply could be cooked with water. One box had enough packs in it to last a family for 30 days. We were amazed by a totally unexpected side effect of this distribution. From members of our church who had relatives in the area, we started hearing about elderly people who had not walked in six months who were now up and walking around again, finding new found strength in their bodies. We soon realized this was not a miracle but simply a result of nutrition. That sparked the idea of sourcing these "manna packs' ourselves and targeting this massive poverty-stricken area called "Happy Land." If nutrition helped these elderly souls so much, how much more would it help give a child a chance in life; help them focus in school. Let them at least grow up and make their own decisions about how to live life. So, for almost two years now, we have been feeding 2,200 children every morning with a hot nutritious meal, cooked on site, at the Gerard-Chapman Benevolence Kitchen, in Tondo Metro Manila. All meals are cooked and packaged there, then taken to Happy Land and neighbouring Aroma for distribution. The children are taught memory verse songs from the Bible and if there are adults involved in their lives, they are taught the Word of God as well. We bought an old container van and turned it into a make shift chapel on Sundays and a Medical Clinic on Saturdays. Members from our church manage this clinic and our young people preach the gospel every Sunday and hold children's church for the kids. As a result, we have seen children now walking, talking, reaching, studying, learning - all because of daily nutrition! When we first went to the area we found kids who were hostile, sad, and with dark and dull eyes. Now these same kids come running every morning with joy on their faces and light in their eyes. The transformation is astounding. They are flourishing at school and passing their classes. They are getting to know Jesus and making Him their friend and help in life. Parents are being saved and having their lives cleaned up as well. It is a long slow process working with them because many of them are into drugs or have been imprisoned for serious crimes. We have held mass weddings for couples who wanted to be married, held various medical and other workshops and clinics, started Bible studies, seen people water baptised - and now we 're hearing testimonies of men able to find work on the docks or on a ship or in the market areas. The miracles continue - and it's all because people have cared enough to love them with meals. These meals come to them from our members EVERY day, seven days a week no matter what. In the midst of the worst storms the meals are there just as much as on a sunny day. Of course, there are many expenses involved in the program, but that is why we are so thankful for the love and support of Sunday Line. Because of you, we are able to do the things we do. We cook, we add the flavours the children find delicious, we distribute daily. Sunday Line, thank you for making miracles happen. We love you and appreciate your so much. What a difference you are making!"